Buy Clublaptop Laptop Carry Bag MacBook Air 13" Pro 13" With 3 Additional Pockets for Accessories with Trolley mount on the back online - Clublaptop - The largest online store by Manufacturer of Laptop Accessories and Spares. These laptop bags are high-quality fashionable carry cases made from high-quality PU material and designed to perfection for enhanced usability and style. Stylish looks, smart & clean chain with rubber pullers, pockets for charger/mouse/pen drives, replaceable shoulder strap and supported by Superfine fur-like padding inside makes this a perfect protective and decorative accessory. 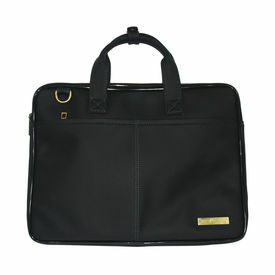 It ideal for use with 13" MacBooks other laptops of the similar size. Protects your laptop against scratches, abrasion, high heat resistance and shocks. Large internal capacity bag. Carry a netbook or a tablet without fear of pressure. Multifunction storage bag design: There Additional pockets for power cord, mouse, tablets, chargers or other accessories. Portable comfort zone as carry handle is long lasting and very comfortable to hold.